Are you also planning on spending a few days in Paris? Then you must download our Free 4-Day Paris Itinerary! While visiting Paris, it’s very common to take day trips outside of Paris and away from the hustle and bustle of the city. With lots of places to see and do close by, it’s easier than ever to travel to beautiful sites in one or two days on easy day trips from Paris. If you’re looking for some train trips from Paris, or to simply venture outside of Paris for a few days then read here. Visiting Versailles, Giverny and the Normandy D-day beaches are the some of the most popular and as such, we’ve already written some in-depth articles about them. We’ve gone further to bring you the best day trips from Paris! The Château de Fontainebleau has been a wonderful sovereign residence for eight centuries. For the Capétiens, Valois, Bourbons, Bonaparte and Orléans – it has been home to all members of French ruling dynasties. The estate became a huge palace in which many momentous historical events have been played out. Giving an unparalleled view of French history and culture, we suggest going exploring the 1500 rooms it has to offer in the castle and exploring the 130 acres of land that surround it. With beautiful gardens and scenery – it’s perfect for taking beautiful pictures. Explore to your heart’s content and have a walk through the woodland and forest! The national park which is a huge forest hosts a popular famous location for hikes and rock climbing – a great place for a family day out in France. Once under sea level a long time ago, the ground is now made up of incredible white sand, perfect for a romantic walk near Paris. Only a 45 minute train journey on the Paris Transilien from Gare de Lyon. Take the train for either Montargis Sens, Montereau or Laroche-Migennes, getting off the train at Fontainebleau-Avon station, then take the ‘Ligne 1’ bus in the direction for Les Lilas, descending at the ‘Château’ stop. A full price ticket is 11€ with reduced tickets at 9€ and you can read about more specific requests on prices at the château’s website. Video guides are priced at 3€. The château is free to visit on the first Sunday of every month and you can travel there forfree by using your Navigo découverte pass for the train, you can read more about the travel pass here. The Vaux-le-Vicomte estate spans nearly 500 hectares and hosts a beautiful château. It is testament to an era and the fruit of the bold vision of Nicolas Fouquet, Superintendent of Finances under young King Louis XIV. You can discover its fascinating history, the works of iconic 17th century artists and see the plots against the royal court. The candlelight evenings they host their every Saturday evening between May and October. Visitors can experience the 17th century château and its Jardins à la française by the flickering lights of over 2000 candles. It’s an enchanting and romantic evening that will give visitors a new perspective on the estate! The fortified medieval town of Provins is on the same train line as the estate. Away from the usual foreign tourist route – it’s great for kids as there’s a tower, ramparts and underground passages. Lots of events going on in the summer such as jousting knights! The town hosts plenty of things to do and see with some good restaurants! You can take a train on Transilien Line P direction of Provins directly from Paris’ Gare de l’Est station. 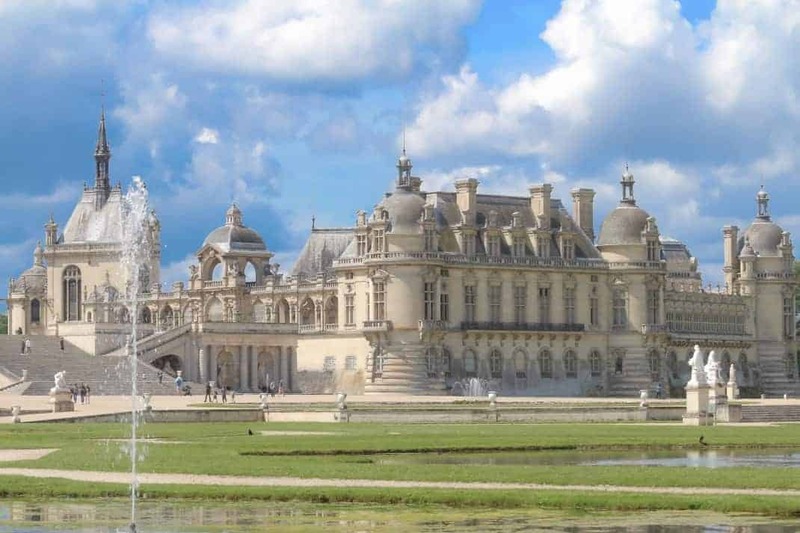 Get off the at the Verneuil l’Etang train station and then there is a “Châteaubus” shuttle bus to pick visitors up from the Verneuil l’Etang train station to take you to the Château de Vaux-le-Vicomte. The shuttle is in front of the train station exit. Direct trains from Gare de l’Est every 60 minutes with a travel time 35 minutes. COSTS: A day ticket for the estate costs 15,5€ for a full priced ticket and 13,5€ for a reduced price ticket. You can find more about the pricing and opening hours on their website. The bus is cash only but you can travel to the château for free using the Navigo Découverte pass. Given to the Institut de France in 1886 by the Duke of Aumale – the Château de Chantilly is one of the finest of France’s cultural heritage sites. Located in the Oise department in the north of France, it was once home to the son of the last King of France, Louis-Phillippe who is considered the greatest collector of his time and the château is home to countless works of art and precious manuscripts. Also in the region is the famous Chantilly Racecourse which is great for a day at the races with your friends and family! The château is the second largest collection of antique paintings after the Louvre. So for the price of your ticket you can visit a world-class museum, a beautiful château, exquisite gardens and it’s great stables all together! It has the perfect feeling to help you take a journey back through time to see how the royals of France lived. You also get a free audio guide with the price of your ticket. The racecourse is the perfect day out, whether you just want to go visit it or watch the races themselves. You can take the train from Paris’ Gare du Nord using the SNCF main lines. The journey takes 25 minutes and you exit the train at at “Chantilly-Gouvieux” station. Also, you can use your Navigo Découverte pass for free travel using the RER line D, exiting the train at the same exit of “Chantilly-Gouvieux” – this journey takes 45 minutes. For a full grounds ticket, the full price ticket is 17€ with reductions at 10€. For more information on visiting hours and special prices you can see their website. A fantastic day trip out of Paris to explore the history and culture of the art world of France is to Auvers-sur-Oise. Once the home of Van Gogh, it’s beautiful scenery and town was the subject of many works of art by Van Gogh, Gauguin and Cézanne. Walk up past the famous church to the final resting place of Van Gogh and his brother Theo in the local cemetery. It offers incredible views of the town and countryside and you can carry on past the subject of many of Van Gogh’s works – the famous cornfields. We suggest popping down into the Absinthe museum and then head over to the Auberge Ravoux for a delicious meal and genuine absinthe, where Van Gogh lived, painted and died. It’s a great day out whether you’re a fan of his work or not. Take the Transilien line H from Paris’ Gare du Nord in the direction of Pontoise to the stop St Ouen l’Aumône. Then change to the Trasilien line H in the direction of Persan Beaumont, for 3 stops until Auvers sur Oise. This is covered by Navigo passes. Free to visit, add the price of your travel ticket and anything you buy there! So there you have it! Some of the best day trips outside of Paris.